Project Leadership, the classic, best-selling textbook originally by Wendy Briner, Michael Geddes and Colin Hastings, anticipated so many of the changes in approaches to project management that are now regarded as mainstream - not least the focus on behaviours. 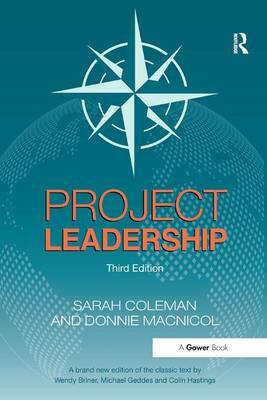 The Third Edition by experts Sarah Coleman and Donnie MacNicol has been substantially rewritten, introducing new material and experience reflecting the transformation that has taken place in the world of projects and leadership. Project Leadership Third Edition looks at the nature of the leadership role in projects, why it is significant and how it impacts the processes throughout the project life-cycle from shaping and scoping, start up and delivery through to project closure. The authors put considerable emphasis on a set of core capabilities around the themes of vision and strategy, relationship building, communication and engagement. The book also focuses on building personal and organizational project leadership capability including models, tools and diagnostics drawing on experiences of working with projects and organizations from multiple sectors and across the globe. The Foreword and Endorsements have been provided by industry leaders. Sarah Coleman and Donnie MacNicol have retained and built on the wonderful range of simple, imaginative and very applicable models and perspectives developed by the previous authors. Every project leader, aspiring project leader and organization with project management communities should own and use a copy of this book.